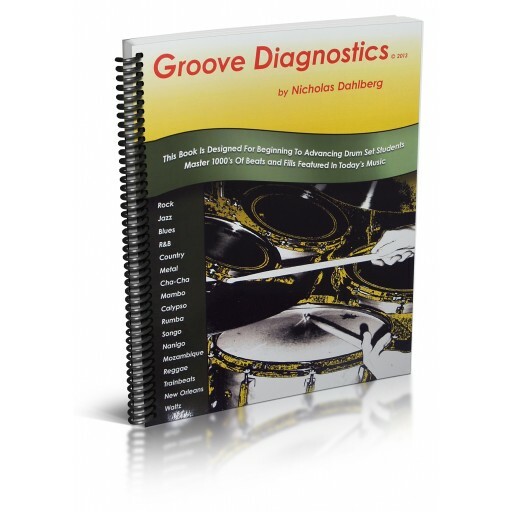 Groove Diagnostics – Page 56 #1-4 Shuffles! This are shuffles grooves from my book Groove Diagnostics, Page 56 #1-4. This section deals with shuffled 8th notes on the hi-hat, “2″ and “4″ on the snare drum, variations of quarter and shuffled 8th notes on bass drum and fills of the fourth measure. Depending on the tempo and feel you play these beats and fills, they can be played in Rock, R&B, Country and Blues. Happy Shuffling! Groove Diagnostics is a book that started working on in 2001 and finished in 2005. It has everything from Rock to Hip-Hop to Mambo to Jazz. For every groove you learn a fill! No other book is formatted this way!